The future of Grindlewood depends on the residents of its enchanted garden. Soon they become embroiled in a most perilous quest – to find and decipher Wanda’s secret scroll and cast the only spell that can destroy the evil, vengeful warlock, banishing him to Warlock Hell forever. Thrust into the climax of a centuries-old feud, can the reluctant heroes really overcome such terrifying power? 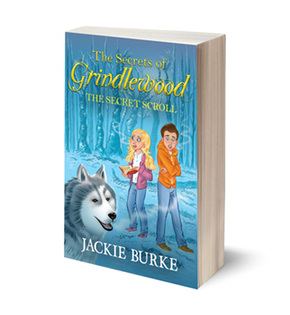 Why did Luke disappear and will the same fate befall Jamie and Jemima, the new residents of Grindlewood mansion? Will Timber, the brave malamute, be able to save them all? "I thought the story was really good because it was exciting and full of adventure. The opening battle is amazing and immediately gets you involved in the story." "I bought this book for my daughter, who is quite selective about our night time stories,... but this was a fantastic adventure and she can't wait for the next book in the series. No doubt, this will be a modern classic for kids." "...and kids enjoyed it too. Looking forward to the follow up / sequel. Jackie Burke is a fantastic story teller." Timber the brave malamute leads the enchanted animals of Grindlewood garden as they continue their perilous quest to defeat the wicked warlock Worfeus and save their home from destruction. The determined friends have finally found the secret scroll, but they struggle to understand the ancient super-spell written inside. The race is on to crack the code before Worfeus can escape his forest prison and come to Grindlewood in search of revenge. 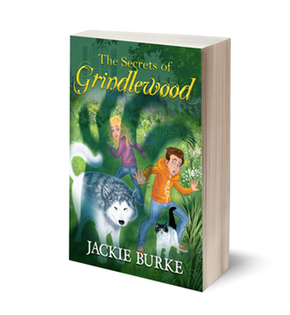 As Jamie and Jemima Grindle slowly uncover the secrets of Grindlewood and its magic, they too are sucked into the animals’ quest and they soon find themselves in grave danger. Do they really know what is at stake? And can their beloved dog Timber really take on such an evil warlock? "The book was really good and I would give it 9/10. Timber was my favourite character. I think children who love animals, adventure and magic will love this book." "The book was amazing, I would give it a 9/10.... I can't wait till the third book comes out. It sounds as magical and adventurous as the first two." "The Verdict. A classic tale to delight readers aged eight to 12." When Queen Lyra hears that the residents of Grindlewood garden have defeated the wicked warlock, she decides to enlist their help to release her from the Worfagons’ curse. But it soon becomes clear that the queen is not the kind and gentle ruler she once was. After years of suffering under a terrible spell that left her in the form of a tree, Queen Lyra is bitter and angry. She becomes obsessed with Jamie’s beautiful dog, Timber, and threatens to keep him for herself unless the children agree to help her. She sends them on a quest to find the lost Book of Magic, an ancient and powerful book which holds the magic that can free her. Timber the brave malamute once again leads Jamie, Jemima and their loyal band of pets in this new adventure. 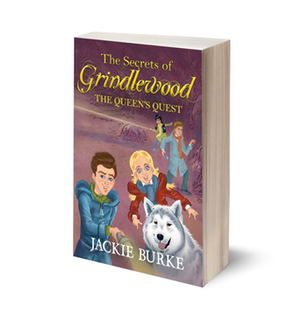 Their quest leads them to strange and eerie places, where they must face down mortal danger, dark magic and evil enemies to find the Book of Magic, free the queen from the curse, and ensure Timber’s safe return to Grindlewood. "Fantastic read for kids (& adults :-) ! We're halfway through this third installment and we think it's the best one yet! Animals, tunnels, butterflies, goblins, gold... It's full of intrigue and interesting adventures. Couldn't recommend it enough for storytime before bed. Brilliant!" "This book was an amazing read - filled with intrigue, magic and brilliant battle scenes. I especially loved the fact that it's a fantasy book. I love fantasy books! Like the other installments in the series, I didn't want to put it down. The pages were laden with mystery, secrets and feats of awesome bravery. I recommend this book for ages 9+." "This fourth addition to the Grindlewood series is jam-packed with adventure, mystery and very well described battle scenes! A long enough read with about 300 pages, but it has very big print and is nice and easy. I enjoyed it very much. I would recommend this book for ages 8+." "I’d give this book, five stars out of five!" The Grindlewood Army is back! The children and their pets have found Othelia's mysterious and powerful orb, but they must keep its whereabouts secret to stop it falling under Worfagon control. The Wandeleis are still recovering from a crushing defeat at the hands of the sorceress Zora. 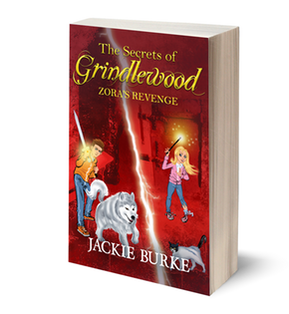 Another attack could spell the end for Grindlewood. Timber holds the key to its future. To succeed he must keep a heart-breaking promise and perhaps pay a terrible price. The race is on to unlock the power of Othelia's Orb, but what strange magic does it hold? Does the orb itself pose the biggest threat of all? 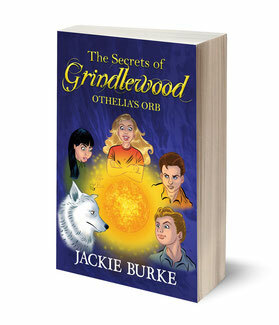 “The Secrets of Grindlewood: Othelia’s Orb", by Jackie Burke, is the latest instalment to Jackie’s successful fantasy series for children aged eight and upwards. The two protagonists, Jamie and Jemima Grindle and their pets have found a mysterious orb but must keep it secret to prevent it falling under the control of evil forces, the Worfagons. There is much to like in this book: action and battle scenes galore, likeable characters and a big mystery to solve!"